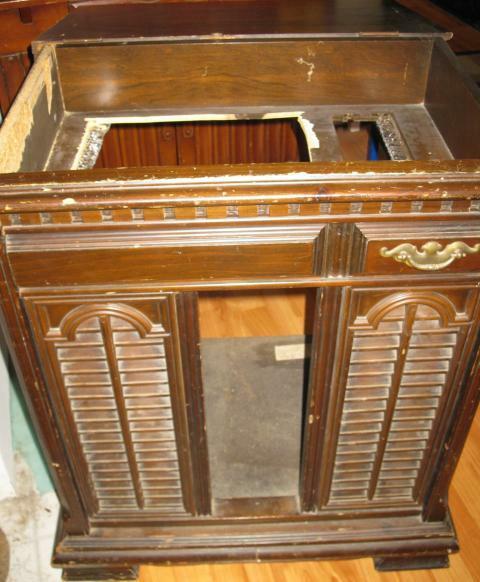 We've had this old, scarred up phonograph cabinet for years. I've been hiding it under table skirts and the like so its done duty as a plant and tv stand in the guestbedroom on and off. I decided if it was staying, it had better find itself a purpose and what better than as an incubator and brooder combo! We'd considered buying an incubator, but given how little storage we have in our small hobby farm home, it didn't make sense to buy something which would only serve one purpose. 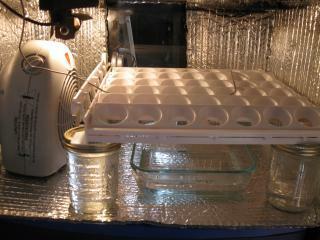 This way, I have an incubator, a brooder and a cabinet stand that can be used for anything, even while in use! The concept is to build a combination incubator and brooder, by using self-contained systems. For example, the egg turner tray will be removeable so once the chicks have hatched, I can place them in a readily accessed bin for their comfort and easy clean up. This design has an independent storage area at the bottom, which can be lifted out to expand the system by installing another egg turner tray or additional chick bins. Versatility and utility is the overarching goal here. It took hubby an hour or so to pull out all the old electronics, wiring, speakers, etc. Then he cut a larger hole to allow for a viewing area. Its roughed out at present, but we'll be tidying up with a Dremel and sandpaper.This picture shows it with the lid flipped backwards to access the viewing area, where the controls will be. 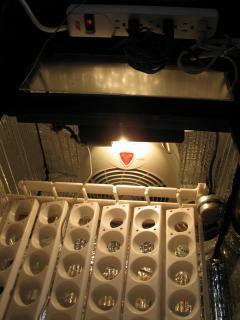 This way, I can tweek the incubator's settings, see the chicks and add water without opening the incubator. We then cut pieces of Reflectix (really cheap) insulation padding into panels. The louvered panels were removed to insert insulation tape covered cardboard pieces so no hot air could escape, then we screwed them back in. 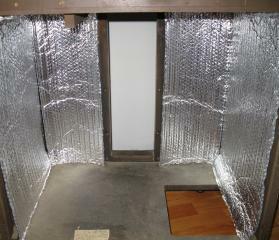 Then, for good measure, we covered them in Reflectix, just in case. From the front, you cannot tell there's insulation within - these are popped in for mockup purposes in the picture, but they needed to be stapled in to tidy things up. We've glued in sections of glass to cover the center portion, for additional viewing. 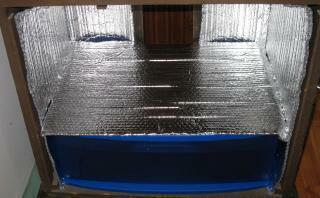 We've designed this incubator to have three zones, the top is the viewing area, accessed by lifting the hinged wood top. This is where the electronic controls will be, as well. The middle is the incubator area, which is fully insulated, where the egg turner, brooder shelf is and the heater, fans, water basin, etc. The lower level is storage for now, though the framing and drawer are Sterilite, so I can pop them out and install more egg turners, etc. Right now, the storage compartment is holding extra bulbs (gotta have them on hand), extra silicone (in case we find a leak) and extra thermometers (we're neurotic). The above picture was taken during the mock up phase, once we ensured everything was measured correctly, we stapled in the Reflectix which smoothed out the bumps and gaps, not to mention made it look tighter and tidier. We do like a tidy incubator. Then comes the guts of the incubator, picture is looking in the back door: 4 canning jars act as risers for the egg turner as well as heat sinks as they are filled with water, with a Pyrex pan tucked underneath for humidity. We're going to drill a hole to pass through some aquarium tubing connected to a picnic ketchup bottle to deliver additional water. This high utility, minimalist set up allows us to add turners or yank the whole thing out to use the middle zone as a brooder once the chicks are hatched. 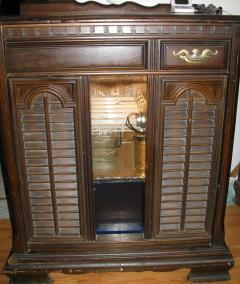 This view is with the top panel open, looking down through the viewing port. The heating and fan unit is the Pelonis Fan Forced Heater (Model: HF-0003), which blows mid-level at the turner, all cords are run through the access panel to the viewing zone. This way I can turn the entire unit on and off without opening the brooder zone in the middle. We are using a 40 watt china cabinet presentation light picked up at a thrift shop to heat our incubator. This is the view from the top, with the lid down, showing our remote Taylor thermometer, currently reading 89F and rising. 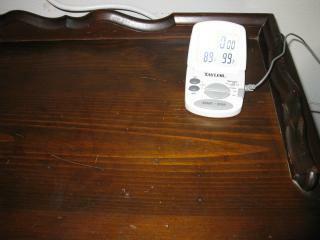 The Taylor thermometer is a really cool one - you can set it so an alarm goes off at a set temperature. For us, that will be the 101F since we don't want to overheat the eggs while incubating. Once the eggs hatch, we can reset this temperature for the chicks. We'll continue to test our new incubator/brooder unit. So far, it's doing great. It takes about 24 hours to heat up with just the hutch light but we can heat it up quickly with the space heater/fan combo. We've trying to figure out a way to grab some eggs out from beneath our very protective Ruby, a Rhode Island Red, without bloodshed (volunteers, anyone?) to test it, but we've also ordered our first set of eggs. We will update once we do so! Please don't ask me what this thing cost to make - I'm in complete denial! Great idea to use what you already have, as well as making it still functional while not in use. There is no information on a hydrometer or thermostat. Is there one built into the fan? Whoa! I'am definitely saving this gorgeous little gem! 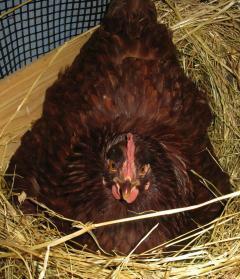 I can't believe your Rhode Island Red is broody. Mine have never gone broody in there 2 years with me. Is there any trick you used or any tips you can help me with to get my hens to sit down? Any more pictures ?!? that is awesome ! !